Sunday, October 16 – I woke up this morning and the world had been transformed. When I went up to the Bridge for my final ice-observation duty around 11:00 a.m. (OK, I was late, it was 11:15) I was just in time to witness our departure from the solid ice of the Arctic (I wonder if I will ever see that again). 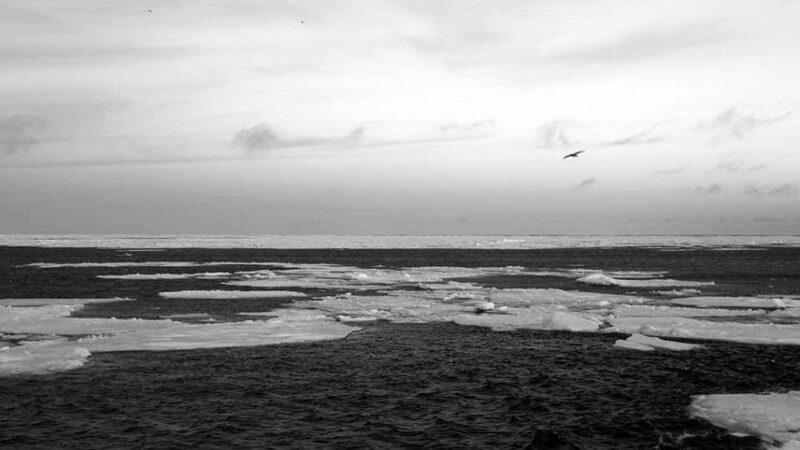 Most remarkable, however, was that as soon as there was any open water (still with lots of ice floes as big as the ship filling half of the ocean surface) the skies were suddenly teeming with bird life. What’s more it was bright and there was just a hint of waves on the surface. As the day progressed, we got to see more and more evidence that we were heading away from the Arctic and into normal ocean conditions. The gentle waves grew more and more pronounced, the ice floes became sparser and, between 11:30 a.m. and 3:30 p.m. we even got to see the sun rise above the horizon again for the first time in ages! At the end of the afternoon, I went back up to the bridge and Holger, the officer on watch from 12:00 to 4:00 and who was famously at the helm when we collected our first photographs of vents in the Arctic back in 2014, pointed out that with more than 100 kilometers (60 miles) of visibility (Wow, again! ), we could actually see the north shore of Svalbard silhouetted against the sunset. Soon enough, it was dark and also too cloudy for any sightings of the Aurora Borealis, which remains the final part of my quest for this voyage. 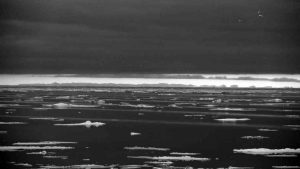 But as the watch rotated from Mikhael to Igor, we heard the slight change of engine sound that indicated we had cleared the last of the ice floes and, hence, the ship could increase from a maximum speed of 7 knots when travelling in ice to its more normal transit speed of 12.5 knots when moving through open water. By late evening two more remarkable things had happened: First, I noticed that both the air and surface ocean temperatures had finally risen above 0°C (32°F) for the first time in many weeks and, second, as we rounded the northwest corner of Svalbard and broke the invisible circle of latitude of 80°N, the waves picked up, signifying that we were in truly ocean waters. For some, that is a bad sign because they are worried about getting seasick. But for me, it just meant that I was going to get rocked to sleep tonight, rather than being bounced around by the ship’s ice breaking. I suspect that the truth is that I have more of an ocean than a polar kind of soul. Next upit’s time to write cruise reports and sort out packing lists for things we’ll be shipping home. The other cool news this weekend was that, although I will not be on shore to participate in the National Ocean Exploration Forum being held in New York City this week, our colleague Larry Mayer from the University of New Hampshire, who was also co-principal investigator on the construction of NUI, will be presenting at the conference and has been in touch to invite us to provide some input from this cruise. How cool is that? People attending that meeting will get to learn something of this expedition while it is still underway! Not that you, dear readers, don’t already know it all, anyway: NUI as an AUV in the Arctic, that is sooooooo last month, already!